I glued up the body of the first Sconce today, after sanding all of the parts to 220 grit first. It went OK, and no drama or disasters. 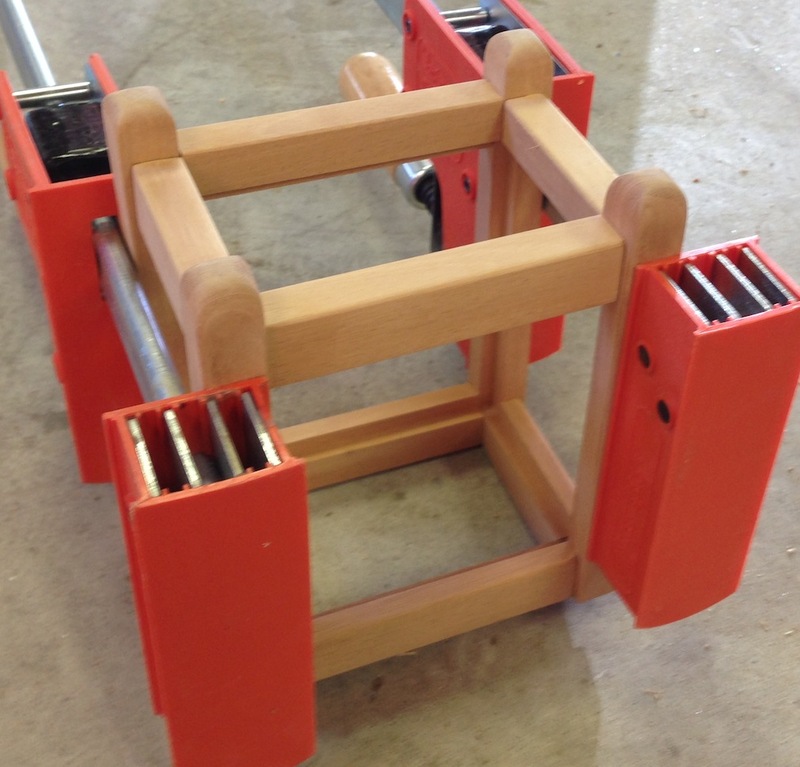 I decided to do it in two stages, as trying to clamp the whole thing at once seemed dicey. Maybe with a strap clamp, or that stretchy plastic warp they use to package goods on pallets. I did have one small spot where the top of the mortise chipped out. It’s not a structural problem, and won’t be visible once the top of the lantern body is in place. My next step is to repeat what I’ve done with the parts for the second lantern body, then work out the design for the top and the wall bracket. I have enough Mahogany for the wall bracket, but I don’t think I have a wide enough piece for the top. I’ll have to dig though my stock and see what I can do — I’d really like to see these finished so I can move on to other projects. I’ve been on vacation in Portland for the past week, so no woodworking — or any shop time — lately. But I’m back now and was able to sneak out for a couple of hours this afternoon. 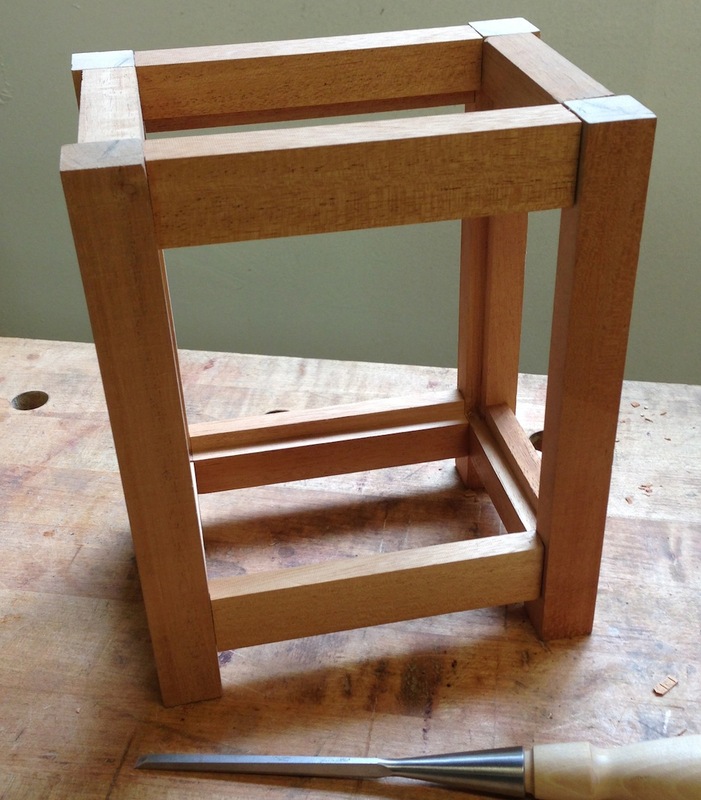 I’d already cut all of the tenons for the rails, and the bottom mortises last week – when my router bit broke. I picked up another bit, and also tried a technique I’d read about for routing mortises. 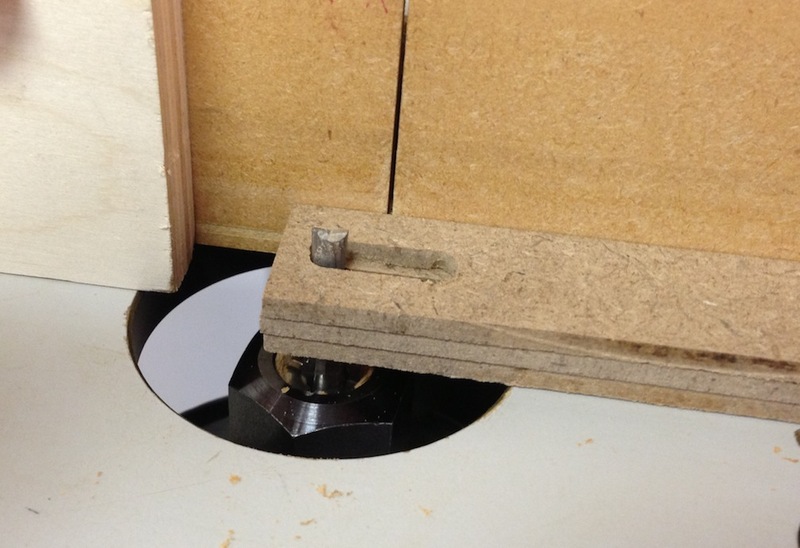 I cut a stack of 1/8″ MDF shims so I could have the bit set to full depth, but plow out just 1/8″ or so in each pass. This was particularly important because these mortises are at the very top of the stiles. I had problems with blowing out the tops on my previous attempt. 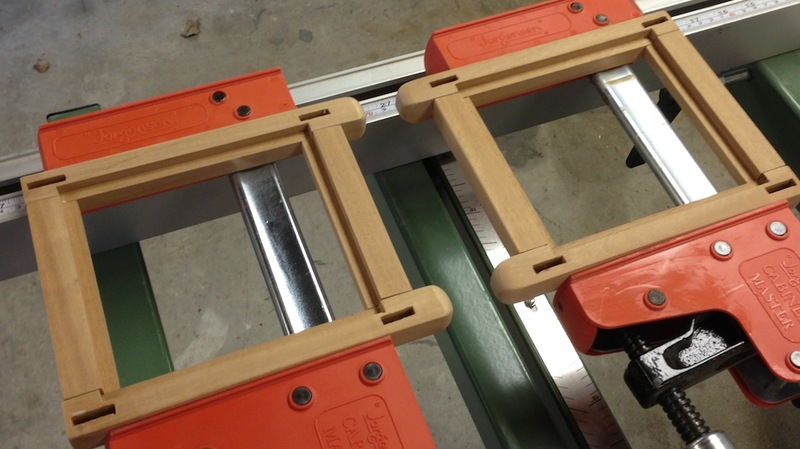 With three (nominal) 1/8″ shims the first cut would be 1/8″ for a 1/2″ deep mortise. The MDF is undersized of course , so the first cut comes in around 3/16″ deep. I stopped the mortises about 1/8″ shy of the correct length to avoid breaking out the top. 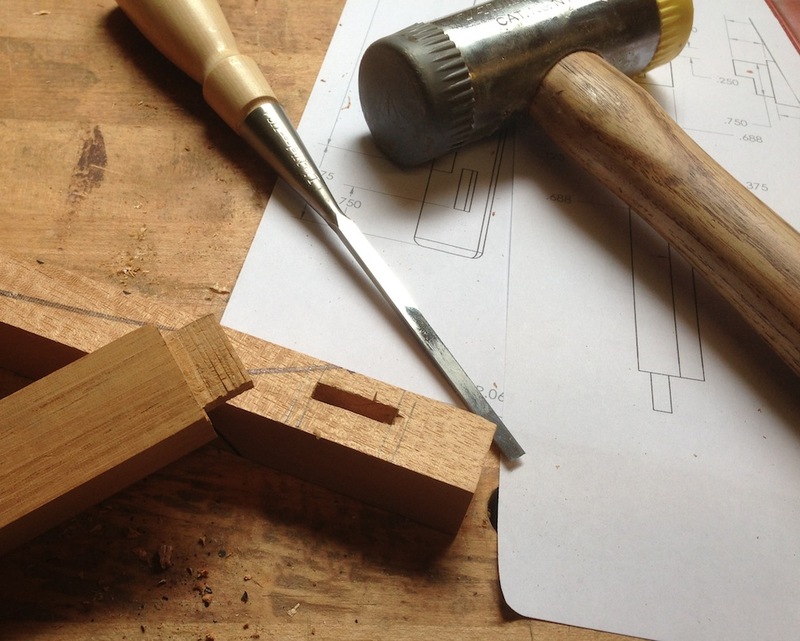 Then I used a 3/16: chisel to square the ends and pare out the top end to the correct length. You can see there isn’t a lot of material left there. You definitely don’t want to pry against it! A better approach would be to leave the stiles long, lay our and cut the mortises to the correct length and then cut the excess material off of the tops. Live and learn. I beveled the ends of the tenons and dry fit everything. One tenon is a little loose, but the rest are a snug fit. I may glue a thin shim of veneer to the loose tenon on general principles, although I’m not sure it’s necessary. With a good fit up up verified I started sanding all of the parts. I also shaped the bottoms of the stiles with a rasp. I have everything to 150 grit right now, but then it was time to make dinner. I’ll sand everything to 220 tomorrow and glue it up with Old Brown Glue. The finish will probably be oil and shellac. I really need to move this sconce project along, if for no other reason than I’m tired of thinking of catchy titles for blog posts about it. 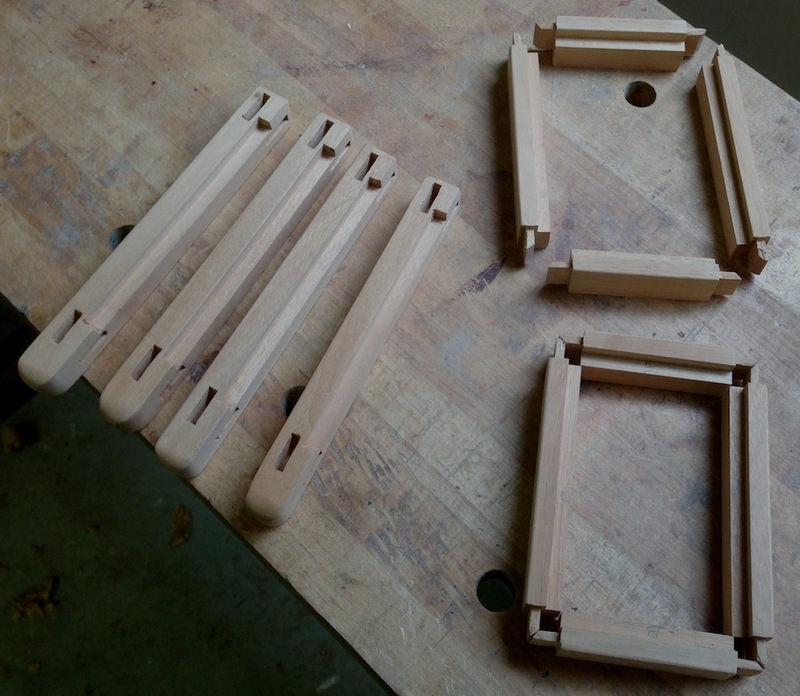 Yesterday I cut all of the tenons, on all 16 rails (I’m making enough parts for two lamps). 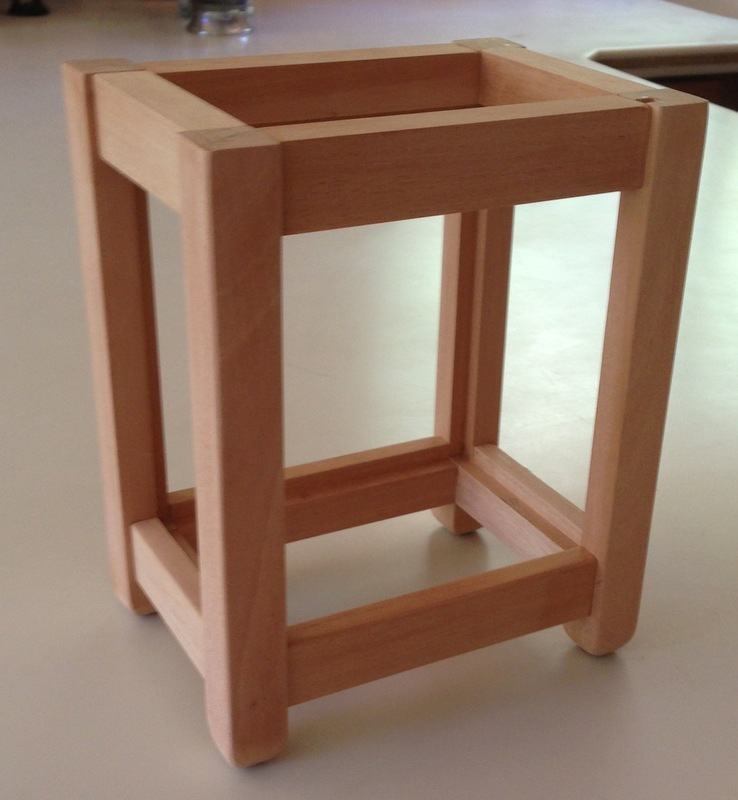 Since I offset the tenon toward the outside face further than I’d originally planned in my model I discovered I don’t need to use stepped tenons. They will fit into the intersecting mortises if I just cut a 45 degree chamfer at the tip of the tenon. I like this a lot better, I should have spotted this in my CAD model – I’ll update the plans to reflect this change later. 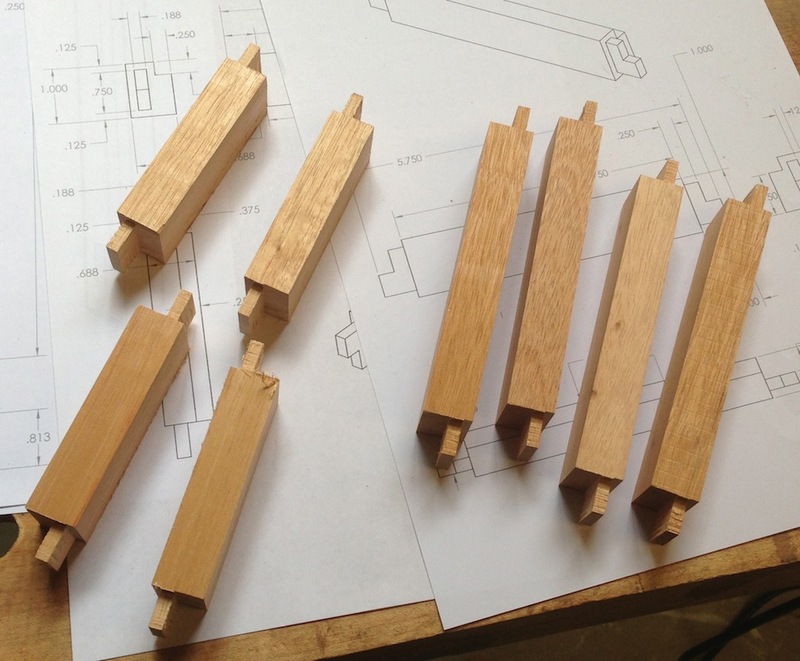 A couple of the tenon shoulders got a little wonky, but I think they be okay after a little paring. I started in on the mortises. 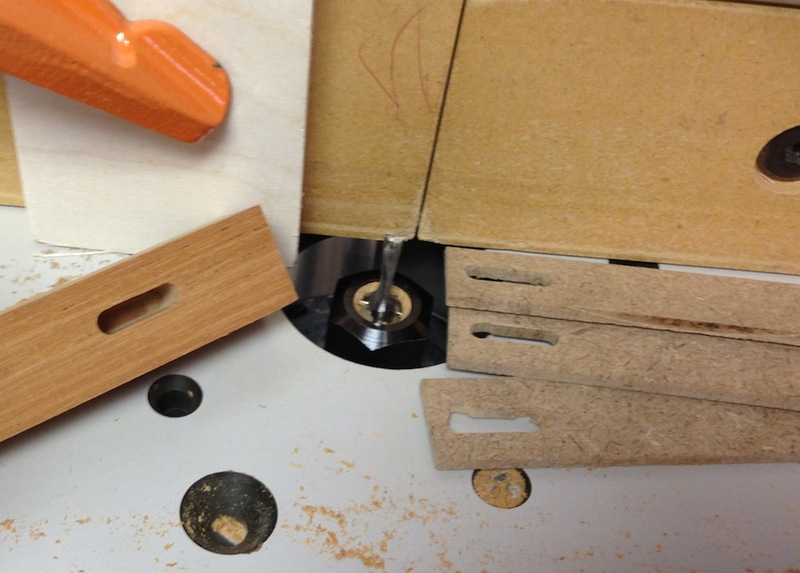 I’m using a 3/16″ router bit to hog out the material and then squaring them up with a chisel. THis worked OK until the router bit broke. I think I need to cut them in several passes — I was cutting them in a single pass, but slowly. Off to Woodcraft today to pick up a new bit, and god knows what else. It’s dangerous to walk in there. Anyway, I read about a technique for using a stack of shims to rout deep mortises, taking out one shim with each pass. That was you don’t have to re-set the router for each cut. I’m going to do this on the top mortises, maybe that will keep me from blowing out the tops (and breaking another bit). I managed to squeeze in a few minutes of woodworking yesterday, between familial errands and making dinner. Dinner, by the way, was Molasses-smoked baby back ribs. This is a new recipe from some foodie magazine I picked up at the store on one of my errands. The ribs were pretty awesome, if I say so myself. I can see a few tiny tweaks to improve them next time, because I’m so making them again. 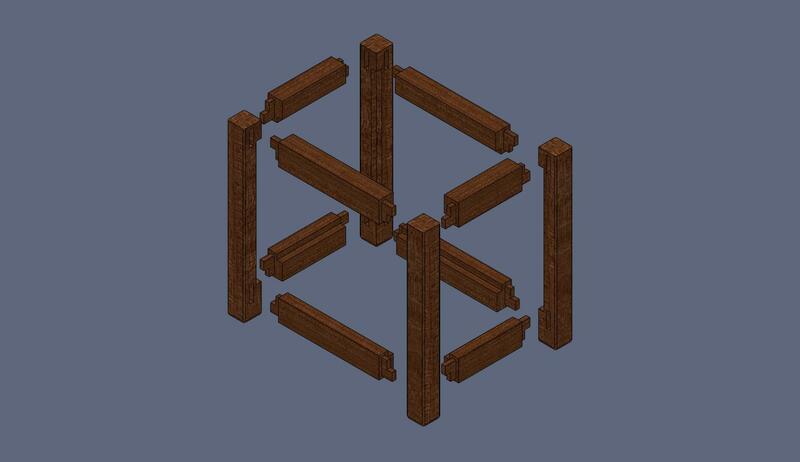 I printed out my plans for the lantern body, picked through my “stock” of Mahogany and started milling wood to make all the parts. I say “stock” because I have a few scraps left over from from the Mahogany Milk Stool I made, plus two warped off-cuts from the discount bin at Global Wood Source. Luckily the mahogany seems to be pretty consistent in color and grain because I was trying to use up all of my small pieces. No major adventures with the milling the stock, with the exception of my growing frustration with my table saw. It has a couple of problems that are just really stupid design flaws. It’s brand new, and though I got it for a fraction of the new price it’s still frustrating as heck. If I’d paid the full street price of $6,000 they want for the I would be suing someone. The main frustration is that the rip fence is nearly useless. It doesn’t have a pointer to indicate the setting, and the guide bar that it rides on isn’t straight. It’s a round tube and I’ve adjusted it using a dial indicator so that it is within 0.001″ of parallel at several points, but in between the mounting points it’s out of parallel enough to bind the blade and stop it when ripping. WTF. I’ll have to replace it with an aftermarket rip fence. 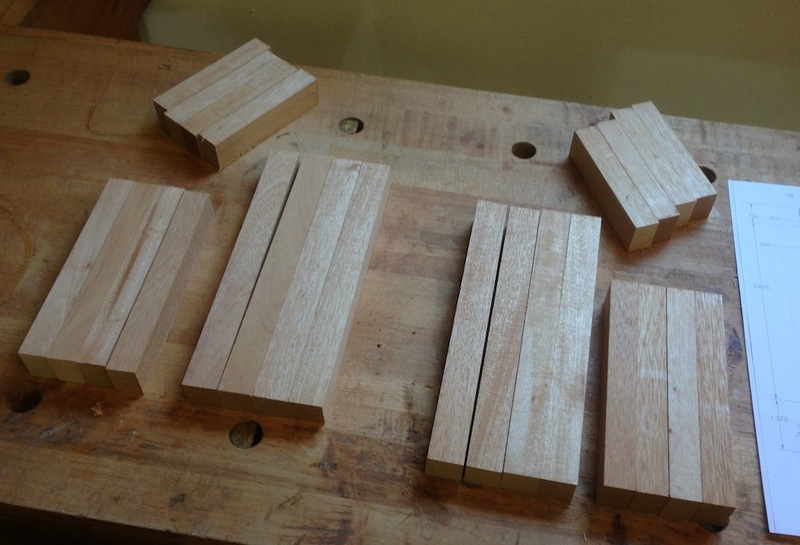 Anyway, I got the stock milled up – enough to make two lantern bodies and enough scraps to help set up and make test cuts. I don’t think I have any errands today. I should be able to cut all the tenons, mortises and rebates and dry fit the bodies. I’m a little afraid. If it goes as planned it will be completely anti-climatic, and if I run into more problems it’s going to be a tad embarrassing. I think Ralph is tired of me rambling about this silly project, time to get the show on the road. This little sconce seems to be my personal windmill to joust with. 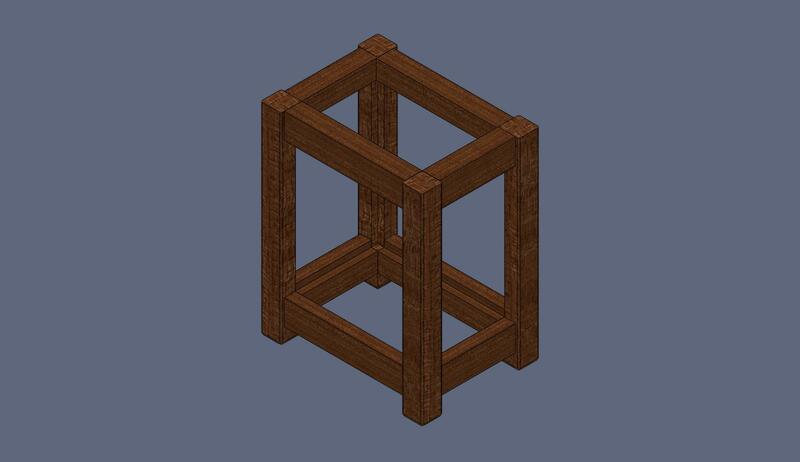 I’ve drawn it in Sketchup twice, and and again in SolidWorks twice. I updated the model this morning to better accommodate the reality of the intersecting mortises and the rebate for the glass panels. 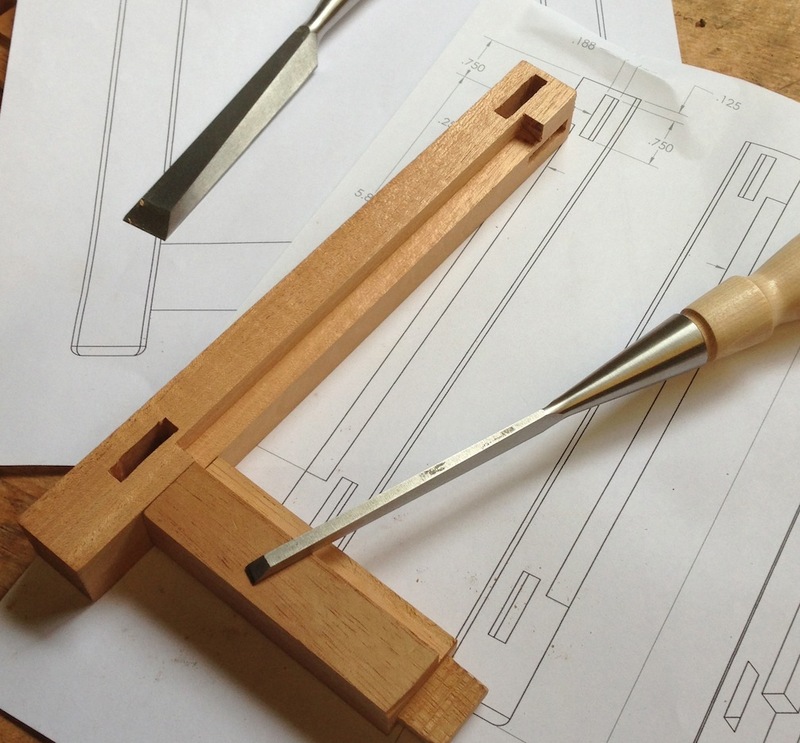 In my previous version I’d only allowed about 1/16″ between the glass rebate and the mortises in the stiles. In retrospect, that was D-U-M-B. I scaled the thickness of the rails and stiles by 1/16″ of an inch, so I have 1/8″ between the glass rebate and the mortise. It’s still not much, and I’ll need to be really careful not to blow out the wall where they come close. Wish me luck, I’m going to head out to the shop in a bit and mill up some more Mahogany and have another go at making the lantern body. I updated my PDF plans, you can download a copy of the plans if you’re interested in trying this out yourself. Once I get past this part (which I believe is the hardest part of the project) I’ll update the plans with the rest of the sconce. You can look at some of the earlier posts on this same subject to see where it’s headed. My weekends have been overly-busy with end of school year activities for my now 13 son, so I’ve had less time than usual to make stuff in the shop. I had expected to have time this past weekend to make the rest of the tool holders for my cabinet, but events conspired against me. Coming home from work on Thursday I stepped on to the front deck and my foot went through. It shouldn’t have been a surprise, the deck is pretty weathered. So Sunday I thought I’d replace the broken board, but as I looked at it I could see the the joist it rested on was rotted. So, plan B, I’d sister a 2×6 on to that and replace the 12 boards that all attach there right at the top of the stairs. I picked up some lumber, and as soon as I started removing decking boards I could see I was in trouble. That joist was completely rotted, it crumbled away into dust. Long story short, I had to splice in a new joist, replace all of the cross blocking and add some extra support members. Then I replaced the decking boards. In between I stepped on a board the had a nail sticking out. Right through my good tennis shoes and into my perfectly good foot. Ouch.